Give your station a more natural sound. Add a 5000 Hz audio bandwidth filter or processor to your system’s audio chain to make broadcast quality more natural – like conventional broadcasters. This is an upgrade usually performed in conjunction with the addition of a high quality IP76 Digital Message Player and Professional Recording Services (listed below). If your system was installed after 2015, you already have 5000 Hz bandwidth capability built in. See details about the HQ5.1 Broadcast Quality Audio Processor. See also the HQ5.0 Audio Filter webpage. Add convenience, quality and network connectivity. Connect an IP76 Digital Message Player to deliver incredible audio quality to your listeners. Control it by network / IP or by flash drive / USB. Merely slide in a flash drive with the appropriate MP3 files, and the IP76 system will repeat them automatically for broadcast. When connected to your network it serves up a control page you may browse to when you want to change your message program. Maintain a message library on your PC or laptop from which you can edit, transfer and store audio files conveniently. Optional message management, playlist and text-to-speech software allow you to create and process your audio files to increase quality and intelligibility. The IP76 Digital Message Player may be added to most information radio stations, while retaining telephone call-in capability as an override / redundancy. How much better can you hold your listeners' attention when your messages are recorded professionally? Our Recording Services bring a professional sound to your station's standard messages and is free to AAIRO * members for their general messages. Information Station Specialists can even provide time-based messages for calendars of events or seasonal programming for a nominal cost. Learn more about our Recording Services. (*) AAIRO, the American Association of Information Radio Operators, is a nonprofit group of Travelers Information Station operators, licensees and interested others across the country. Membership is free. Visit AAIRO.org for details. Stream your program to the world. StreamCASTing allows you to take your information radio station’s program and stream it directly to your website – or as many websites as you wish. 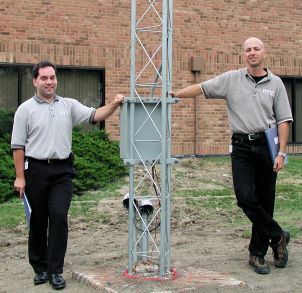 This makes your program accessible on desktop computers as well as internet-enabled mobile devices both inside and outside your station’s coverage range. Includes Network Audio Bridge + universally available software (kit). Monthly “HearMoreInfo” service is required from from Information Station Specialists to make StreamCASTing possible. The charge to offer this service is less than a dollar a day. Keep a Component Spares Kit at "the ready." • RF Arrestor. • Power Surge Arrestor. Inquire for a price on a package customized to your needs. When the situation becomes critical, trigger Flashing ALERT Signs in the coverage area of your station to notify motorists to tune to the frequency and stay informed. Learn more about Flashing ALERT Signs. The 2X Signal Booster raises your antenna higher and produces up to twice the efficiency and signal level. Ideal for federal government TIS stations and/or stations whose range is limited by terrain or local environmental factors. Works with all fixed-location (and certain portable) information radio stations that operate on frequencies in the above 1200 kHz. Note: non-federal information stations must continue to adhere to the 2.0 mV/m signal level limit at .93 mile. Add more radio stations to cover more area. Synchronized repeater stations may be added to broadcast to areas where you are not now covering. A Wireless Audio Link system can distribute the audio program to the synchronized locations without the expense of leased telephone lines. Visit our GPS Frequency Synchronization webpage. Message scheduling by date, day and time. More intuitive on-screen controls, look and feel. Automatic broadcast program restart at power restoration. Existing Workstation Audio Control operators can upgrade to Edition 2.1 with little effort. And we offer a remote method by which we can assist you on-line with installation. Version 2.1 works in conjunction with legacy digital message players and NX8R Player (described far left). Tthe ability to control the station by phone is retained and redundancy added. Visit our Workstation Audio Control webpage. Compare audio control methods here. How can you utilize your existing text-based emergency notification system to inform area motorists and patrons who are not in a position to receive text and email? Indeed, how do you reach out to the larger community – those not registered to receive your emergency alert messages – to tell them to take action? This is ENcast’s unique mission. ENcast is a means of linking an existing text-based notification system, via Information Radio technology, to populations not previously accessible. All in one motion. ENcast Technology may be part of any Information Radio Station – new or existing – transforming it into an avenue to reach the unregistered and motorists in transit; a conduit for critical information in a crisis. See more about ENcast, including which text-based systems are compliant. Add Telco redundancy and maximize phone-based broadcast programming. Flash memory means all programming is safe from power loss. A 16-bit recording rate makes messages sound better. NX8R can handle two live feeds from sources such as NOAA, PCs, CATV, etc. The station identification plays automatically every half-hour as required by the FCC. If you lose your telephone lines in an emergency, NX8R offers control by VHF radio. Learn more about NX8R. Compare audio control methods.